We have been proudly included in the listing of AM Best's Recommended Insurance Attorneys since 2006! As an “A.M. 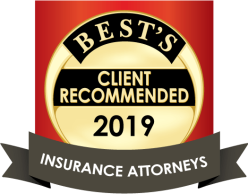 Best Recommended Insurance Defense Firm,” Cascone & Kluepfel, LLP is a recognized leader in the field of liability and insurance defense, and well-known for its outstanding service and reliability. Since 2001, the firm has been providing high-caliber legal representation to insurance companies and their insureds, municipalities, business interests, professionals and individuals throughout metropolitan New York and Long Island. We defend cases involving personal injury, fatality, construction defect, property damage, insurance coverage, and indemnification issues. Our clients attest to our efficiency and individualized attention, and are consistently impressed with our prompt, cost-effective results. Serving Clients Throughout the Five Boroughs of NYC, Long Island & the Lower Hudson Valley Region. Read some of our client testimonials for a better idea of the kind of unparalleled service and results you can expect. Our attorneys have extensive experience in construction accident litigation, indemnification and insurance coverage disputes, municipal liability, premises liability, construction defect, property damage, motor vehicle/transportation accidents involving tractor-trailers, common carriers and leasing companies, liquor liability, products liability, professional liability, sporting venue liability, improper security, elevator liability, dog bites, appellate advocacy, and more. Our team consists of attorneys admitted in the United States District Court for the Eastern and Southern Districts of New York, who also defend claims of discrimination, sexual harassment, false arrest, and federal civil rights violations. To learn how we can assist in your case, call our firm at (516) 747-1990 today.